Are you sick of ceramic tile shower and tub walls? They are the traditional “go-to” product of every custom builder and remodeler who does business in the United States. For today’s owners traditional ceramic tile projects and the not-so-glorious grout joints everywhere are losing their luster. Why – you might ask? Simple – if you’re like my wife Rose and I you want to be enjoying friends, family and living cool experiences (bicycling, hiking, running or experiencing nature). You don’t want to be sweating like a pig inside some cramped shower cleaning grout joints. Also, something tells me these builders and remodelers who were eager to “push” a tile shower are nowhere to be found when you’re stuck cleaning your yucky enclosure! What do you want in a new shower or tub design? What’s making shower and tub wall panels hot today vs. a tile shower? Here’s the big trend I’m seeing in bathroom product selections. From Millenials moving into their first home to empty nesters who have finally gotten the kids “off the payroll” want sleek, clean, contemporary and low maintenance showers. High maintenance is out! One luxury product growing rapidly is high gloss wall panels. They are sleek, easy to clean and ultra-contemporary (if you want boring traditional tile shower and tub walls stop reading NOW!). 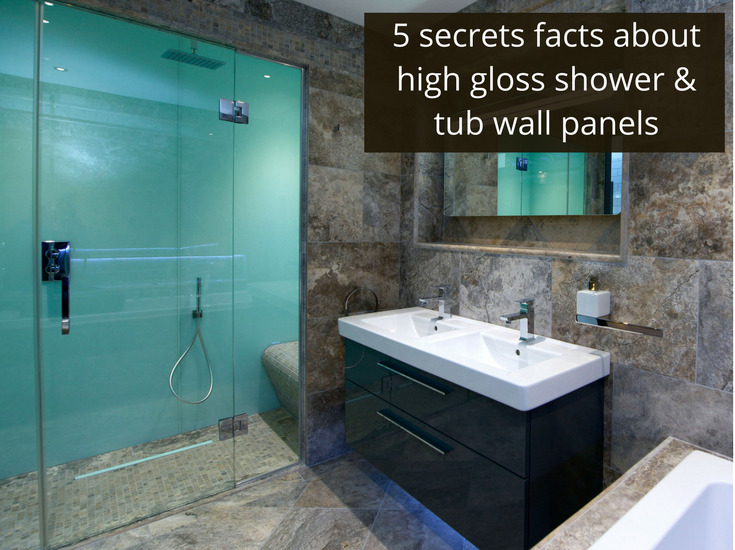 I’m excited to share with you 5 secrets facts about high gloss wall panels (and one new secret fact you won’t want to miss at the end IF you’re on a tight budget). Why am I excited? It’s because I love contemporary and thought this was the hottest product “ever” (gotta say it in a “Valley girl voice) when I saw them at the International Builders Show 5 years ago. The only reason these are “secrets facts” about this product is because we live in the United States. If you lived in Europe or Asia these products would be as common to you as sliced American bread (or loaves of French bread I should say). Let’s check out these 5 secrets facts.